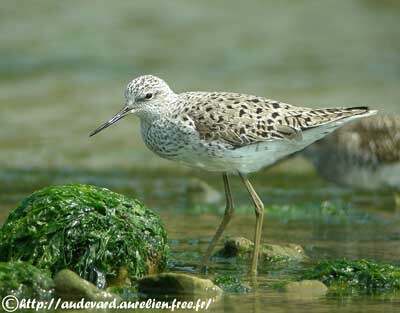 The Marsh Sandpiper is an elegant shorebird with small body. The summer plumage shows great contrast between the dark upperparts and the white underparts. In breeding plumage, the upperparts are pale grey, heavily barred black. The underparts are white. The breast is finely spotted black, whereas the flanks show dark triangular markings. In winter plumage, the upperparts are darker and duller grey. The underparts are white with fine grey streaks on the breast sides. In all plumages, the eyebrow is white, as the feathers at the bill base. The needle-like bill is black with grey base. The eyes are dark brown. The long legs are dull yellow to greenish-grey. Both sexes have similar plumage, but the female is slightly larger than the male. The juvenile resemble adults in winter, but it has browner upperparts, with feathers spotted and edged pale brown. The Marsh Sandpiper utters repeatedly “tu-ii-u” as courtship song. On the breeding grounds, the alarm call is a sharp “chip”. In flight, we can hear a soft, plaintive “kiiuw” repeated three or four times. 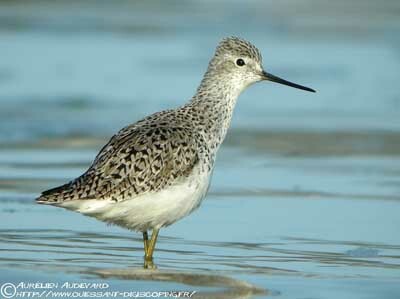 The Marsh Sandpiper frequents steppes and boreal inland wetlands with grassy cover. It can also be found in brackish marshes. Outside the breeding season, it frequents inland fresh to brackish wetlands, and it is often seen at the margins of ricefields, swamps, salt-marshes, estuaries, lagoons and also intertidal mudflats. It usually avoids the open beaches. 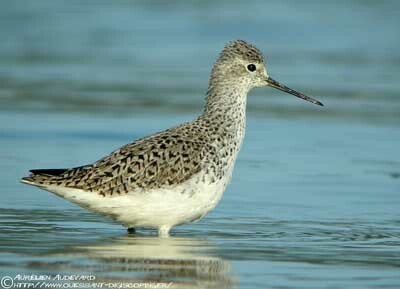 The Marsh Sandpiper spends the winter in Africa and in India, in Persian Gulf and Australia. This species breeds from Eastern Europe to central Asia. In Singapore, they can be seen in salt-marshes, sandy areas, ponds, reservoirs and streams. The Marsh Sandpiper often feeds in shallow water. It walks steadily and pecks from the surface. It also may glean from the vegetation, and probes, jabs or sweeps the bill into the water. When they hunt for fish, they can forage in flocks, even with other species. They also follow the other aquatic birds, and take the preys disturbed by their movements. The Marsh Sandpiper usually feeds alone, but on the wintering grounds or during the migrations, they often forage in flocks of up to several hundreds and with other shorebirds. This species is migratory. The birds fly long distances overland on broad front of many birds. The non-breeding birds often stay on the wintering grounds. 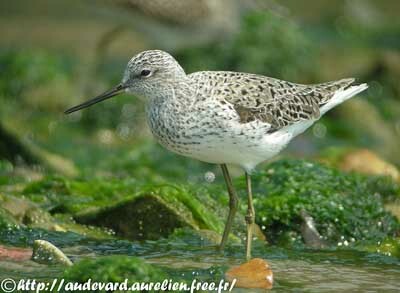 The Marsh Sandpiper is able to travel long distances, and does short stopovers. In flight, the wings appear dark, and the white back patch ending into a point is conspicuous. The legs are held beyond the tail tip. The laying occurs from late April to June. This species is probably monogamous, and nests solitary or in loose colonies with other species. The nests are about ten metres apart. It nests in grassy and muddy areas near freshwater pools, in steppe or boreal wetlands, and also sometimes in brackish areas. The nest is on a mound, close to the water in short vegetation, and lined with dry grasses. The female lays 3-5 eggs, and both parents incubate and care the young. The chicks have creamy-buff upperparts with dark markings. Underparts and face are whitish. They can breed at one year. The Marsh Sandpiper feeds mainly on worms, larvae and bivalves, but also takes small fish, crustaceans, molluscs and many aquatic and terrestrial insects. The Marsh Sandpiper is threatened by the heavy use of pesticides and herbicides when it feeds in cultivated areas or in ricefields. Habitat loss due to agriculture expansion is an important threat on the breeding grounds. The wintering areas are also threatened by the drainage of wetlands. However, the species is not globally threatened, due to the large range.